A powerful and magical civilization that flourished ages ago. 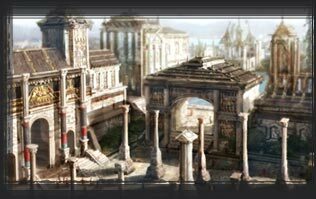 Atlantians became very prosperous after they created substance called Oriharukon. 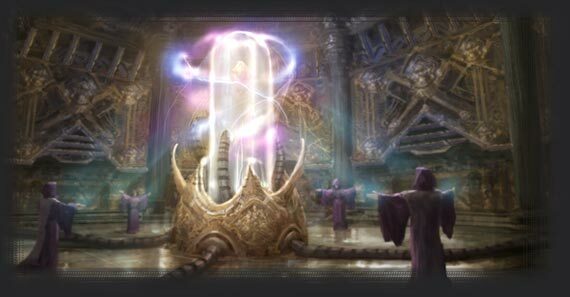 Wanting to learn the secrets of this mysterious material, many other civilizations implored the Atlantians to share their knowledge, but they refused, closing their doors to outsiders. Anyone that persisted, the Atlantians brutally destroyed. Eventually, the Atlantians exhausted all the supplies of the four crystals, the raw materials from Oriharukon. Their thirst for the crystals led to the destruction of four great civilizations (the Yellow River, the Indus Valley, Mesopotamia, and Egypt), and set them on a path to conquer the world to find more. But the arrogance and greed of Atlantians would instead lead to their demise. When they lost control of the magic powers generated by Oriharukon, Atlantis disappeared in the blink of an eye. But remnants of Oriharukon survived. To follow a treacherous path fated to you as a descendant of Atlantis. To find your ancestral home, which vanished off the face of the Earth long ago. To fulfill your destiny: Save humankind from the disastrous effects of Oriharukon, the source of Atlantis' desctructive power. You will embark on an epic journey that will take you to mysterious and dangerous locations around the world, as well as through time and human history. You will enter countless battles against creatures of legend and lore, mutated and deadly due to the influence of Oriharukon. But you will have the help of mercenaries you meet along your way, facing enemies together. You will collect clues from the remains of ancient civilizations, which will ultimately lead you to the lost land of Atlantis, and all the secrets kept there. Recruit multiple mercenaries to join you in your travels. Have up to 8 mercenaries fight alongside you in battle, and shuffle your lineup as the situation calls for. Devise new tactics and maneuver accordingly during combat to expose your enemy's weakness. Mercenaries, like your hero, advance in both level and rank as they get stronger. Test your might and mettle against your fellow players. Participating in the Free Leagues will test your puglistic powers every three hours of the day. And put your money where your boast is by posting a Challenge; then take on all corners wanting to wrest the gold from you. 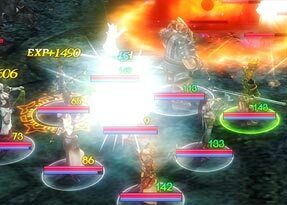 Players have the ability to operate guilds that can take control of a town. Once in power, there are many variables to account for with the control of this community, including the town's policies for security, culture, industry, commerce, health, and the planning and construction of buildings. If you control a town, you have the potential to form your own nation. If you embrace the power, you can become king, with abilities and powers that no other player can possess. You can hire more people and influence guild masters under your command to wield even more power. In addition, you can wage war on other nations to amass wealth. Teach the skills you've learned to your peers, or share your knowledge of monsters you have encountered with novices to help them on their journey. 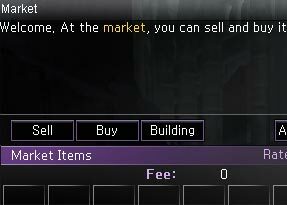 Atlantica utilizes a player-driven economic system. Players alone craft nearly all of the items and equipment in the game after collecting the required materials throughout the world. Atlantica was developed to create 'demand' and then 'supply' the necessary materials in a way that economic stability is guaranteed. Forge weapons, concoct potions, and create necessary supplies using various materials acquired from your enemies. Why stop there? Learn up to 34 different crafting skills available and progress through 100 levels to learn to craft even more powerful items. Refine your weapons through enchantments or enhancements to deal greater damage. A refined weapon will glow, striking fear into the hearts of your enemies.